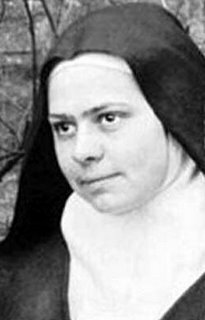 Today, November 8 is the feast day of Blessed Elizabeth of the Trinity (1880-1906). She has been called the Saint of the Divine Indwelling. In 1901 she entered the Carmelite order, receiving the name “Sister Elizabeth of the Trinity.” In his book Redeemer in the Womb, John Saward, points to her as one of three woman in the 20th century who emphasize the importance of Jesus’ life in the womb. (The other two are Caryll Houselander and Adrienne von Speyr.) Another lesser known woman who wrote extensively on this topic was Mother St. Paul. “It seems to me that the attitude of the Virgin during the months between the Annunciation and the Nativity is the model for interior souls, for those whom God has chosen to live inwardly, in the depths of the unfathomable abyss.” From Le Ciel dans la foi.